No.1294.01, 2015 – The Zo ning Map of the Town of Osoyoos Foreshore and Lake Zoning Bylaw No. 1294, 2012, be amended by changing the water use designation of the portion of Foreshore and Osoyoos Lake directly adjacent to Paradise Park RV Resort located at 5901 Main Street and legally described as Lot 2, District Lot 43s, SDYD Plan 12670 from Private Moorage (W2) to Group/Strata Moorage (W3s), and that a bylaw text amendment be made to allow 15 private buoys to be retained in addition to the construction of a new dock. All persons will be given an opportunity to be heard and/or present written submissions on the matter above. Written submissions can be mailed to the undersigned or emailed to info@osoyoos.ca (The Town will only guarantee that emails received to this address will form part of the Council Agenda.) The deadline for written submissions is 12:00 pm (Noon) Friday, May 29, 2015. 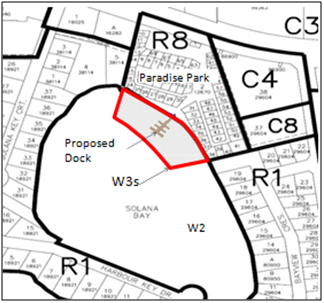 A copy of the proposed water zoning bylaw amendment may be viewed at the Department of Planning and Development Services office, located at 8711 Main Street from 8:00 am to 4:00 pm from Wednesday, May 20, 2015, to Friday, May 29, 2015, excluding from 12 pm to 1:00 pm and excluding Saturdays and Sundays or by clicking here.